In Scouting we believe that young people develop most when learning by doing. Whether climbing for the first time or interviewing for a dream job, we equip them with the skills to fulfil their ambitions in a way that suits them. The Scouting formula is simple. Using volunteer adult leaders and basic facilities, young people develop trust, integrity and a spirit of adventure. Our Scouts are today's happiest, healthiest and most productive citizens; some of them will be tomorrow's leaders. Our work is transforming lives, communities, families and individuals. The impact on individuals is far reaching. A recent independent report showed that 91 per cent of volunteers and 88 per cent of youth members said that Scouting had helped them develop key skills. Employers said that their staff who had been involved in Scouting were above average employees across a range of attributes. Our Programme and Development team work tirelessly to develop the appropriate activity resources that our adult, volunteers need. The latest of these is Our Sporting Adventure, a unique and valuable resource for the five age ranges within Scouting (Beavers, Cubs, Scouts, Explorers and Network) with over six months worth of programme ideas. The activities being promoted are ranked in order of difficulty as Gold, Silver or Bronze and, just like at London 2012, Our Sporting Adventure is about working towards medals as part of a team. The Peter Cruddas Foundation is the sole sponsor of the online competition, which details information about the activities as well as a medal table for teams to check their progress and encourage then to push on for higher achievements. Our National Activity Centres are another way that thousands of young people, whether they are Scouts or not, have the opportunity to learn new skills, take risks and develop confidence in a secure and inspiring environment. Demand for safe, outdoor activities is growing. However, not all young people have regular access to open air activities to develop their educational and physical skills. 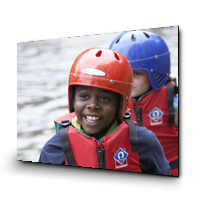 Our challenge is to provide more outdoor activities at our National Activity Centres to enable the children and young people to 'learn by doing' through a diverse programme of activity and challenges. The Association has seven national activity centres in the UK. We have embarked on a major review of our activities to improve our facilities for the thousands of young people who rely on us for outdoor adventure.